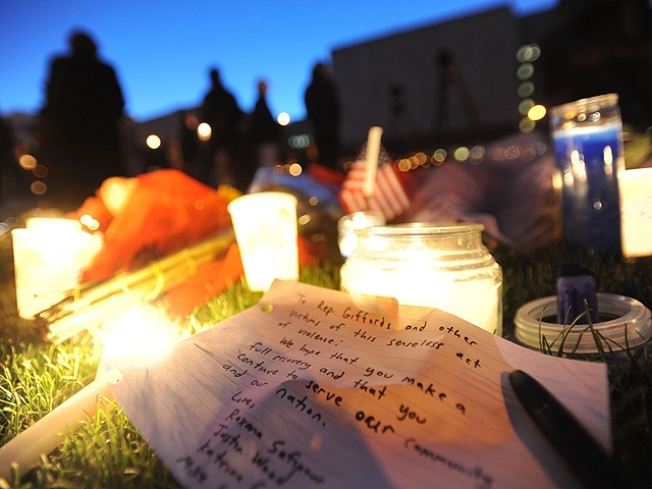 TUCSON, AZ - JANUARY 8: People leave notes, candles and flowers outside the University Medical Center for U.S. Rep. Gabrielle Giffords (D-AZ), who was shot during an event in front of a Safeway grocery store January 8, 2011 in Tuscon, Arizona. U.S. Rep. Gabrielle Giffords (D-AZ) was shot in the head at a public event entitled 'Congress on your Corner' when a gunman opened fire outside a Safeway grocery store in Tucson, Arizona. It was reported that eighteen people were shot, including members of Giffords' staff, and six are dead, including one young child. One suspect is in custody. In the wake of the shooting in Tuscon that killed six people and wounded Arizona Congresswoman Gabrielle Giffords, some elected officials who represent Connecticut said they have not changed their plans to hold public appearances in the state and do not want the way they interact with constituents to change. After the tragedy, the U.S. Capitol Police asked members of Congress to take “reasonable and prudent precautions” regarding their personal safety and security. Jim Himes’ said he and his family received death threats during the health care debate, so he is mindful of the risks but does not want sweeping change to procedures. He does not want people to have to go through metal detectors to meet with elected officials and he does not want to have to wear a bulletproof vest. Himes said he has faith in the system and it would not be feasible to assign personal security to all members of Congress. His office released a statement on Sunday saying his schedule for the coming week, including brown bag lunches in Westport and Fairfield, remains unchanged. U.S. Rep. Rosa DeLauro was in Milford on Monday and visited the Milford Senior Center, where she talked about health care. She too does not want what happened in Arizona to change the way the system operates. We just need to calm down the rhetoric, she said. Connecticut’s newest Senator, Richard Blumenthal, started a two-week statewide public listening tour on Monday and said he will work with local law enforcement to keep constituents and staff members safe.